I love shabu- shabu or steamboat! Especially on a cold and rainy night! 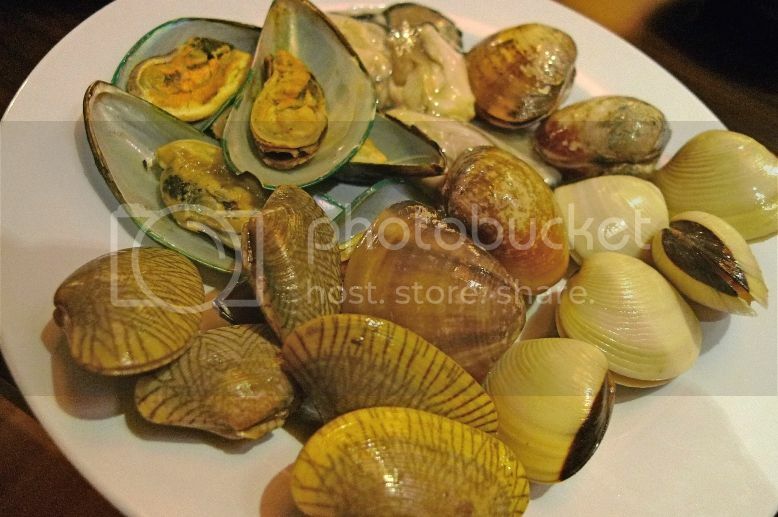 The weather had been just that recently, so it was not unusual that I ended up going for a few steamboat dinners these past two weeks. Of all the steamboat dinners I have been to, I think my favourite must be the Shabu-shabu Buffet at Nagomi Japanese Restaurant. 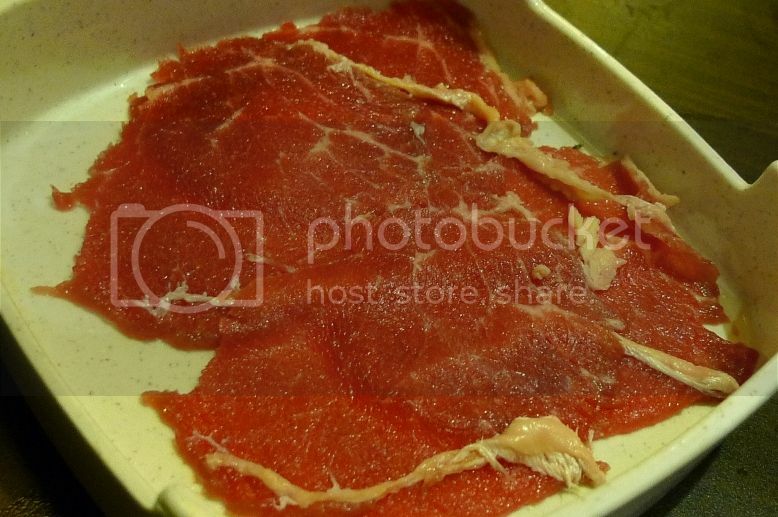 Located on the 1st floor of Menara Hap Seng at Jalan P. Ramlee KL, Nagomi is having a promotional price of their shabu-shabu buffet at only RM32.80++! I actually loved Nagomi so much I went twice! The first time, it was my birthday dinner and my friend booked the restaurant at the last minute. So we ended up sitting at a table for two hidden at a far end corner. It was OK cos we had lots or privacy. Haha! 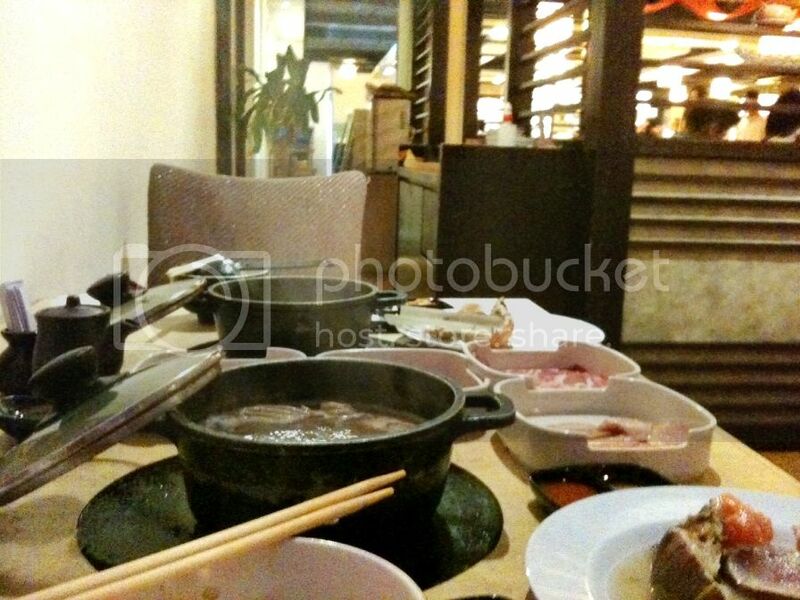 The second time I went with two friends and we were given a table nearer to the buffet spread. Besides having easier access to the food, I discovered one major advantage sitting near the buffet spread and I'll tell you what it is later. 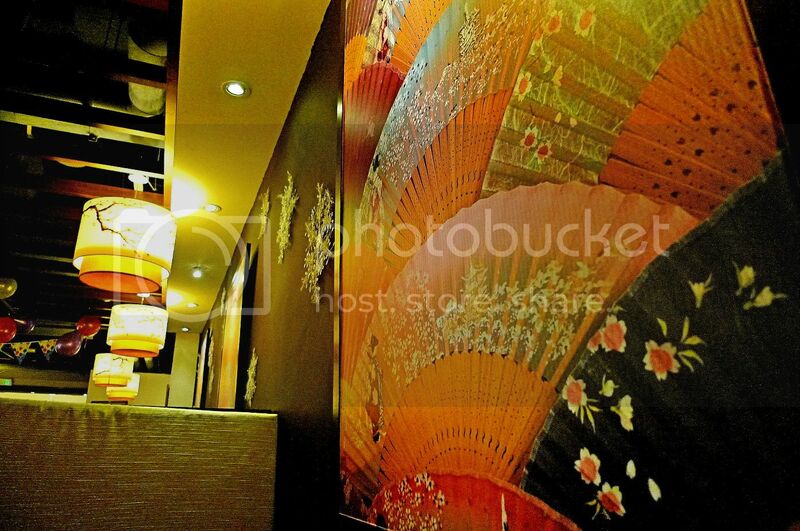 What makes Nagomi different from all the other steamboat restaurants? I must say it's their very fresh seafood! Yes, fresh seafood makes ALL the difference! I'm afraid that having eaten at Nagomi, I would find it hard to accept other lesser quality steamboat. The first time I ate there, I was quite amazed to find endless supply of tiger prawns, crayfish (mini lobsters), flower crabs, salmon, scallops and oysters. 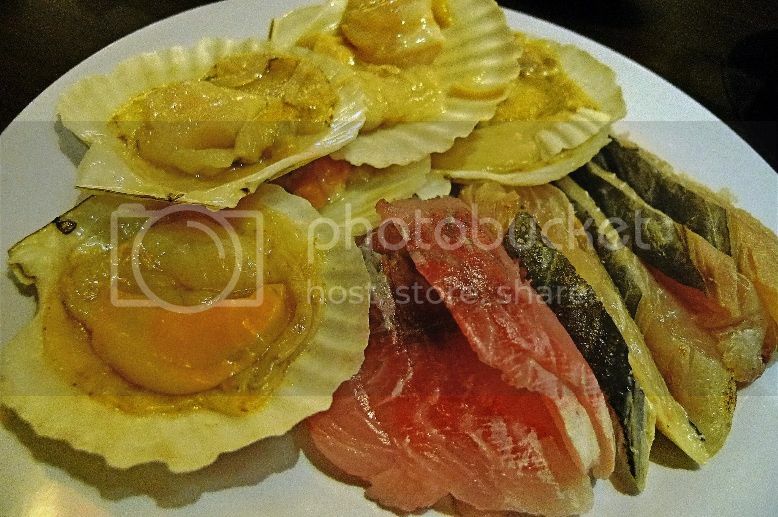 Eat all these all you want at only RM32.80++? It was unbelievable! 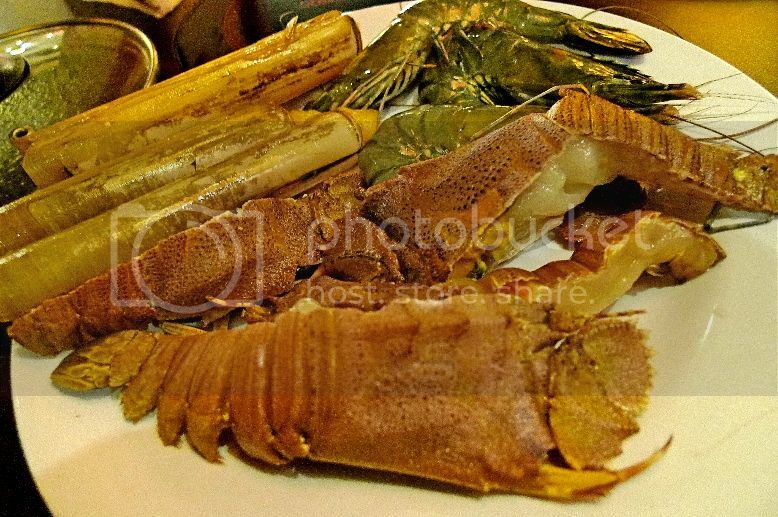 I have to admit I have yet to eat such fresh lobsters and scallops in any KL restaurants at such an affordable price!! If you have, please let me know where! However, during my second visit, some things changed and I would let you know what in a minute. 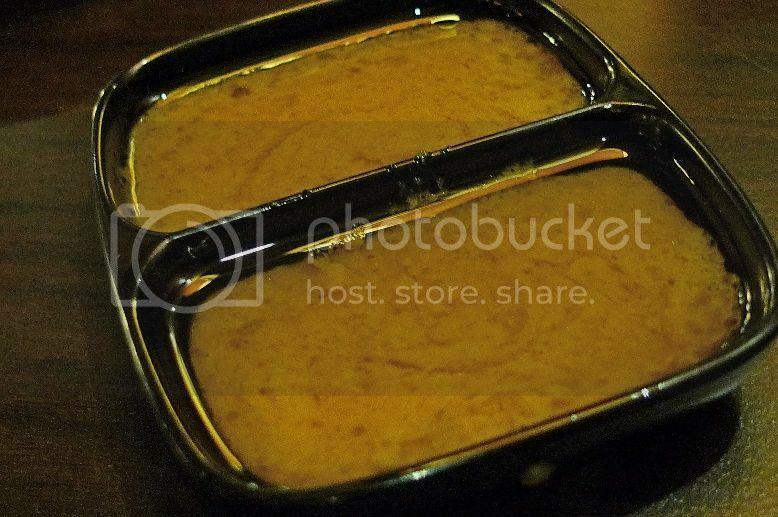 There were many different types of sauces to dip your cooked seafood in. I could not remember their names, but after trying all of them, I settled for just one - the wafu sauce. It was yummy!! So on my second visit, I took only my favourite wafu sauce! I thought of filling up a bowl with the sauce but then decided not to appear so greedy. Haha! 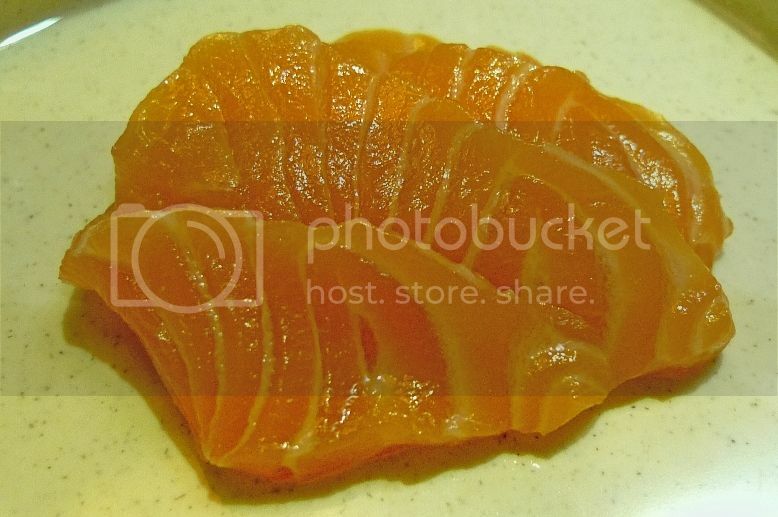 When I first ate at Nagomi, I was actually quite amazed that they were providing unlimited fresh salmon. As if unlimited lobsters and crabs were not enough! I remember telling my friend how on earth do they make money charging us at only RM32.80++ with all these expensive seafood? And then, on my second visit, I discovered they did not have crabs and salmon! Nooooo!!! Upon asking, we were told that salmon would be out only at 8pm. True enough, right on the dot at 8pm, a staff rang the bell announcing the servings of salmon. 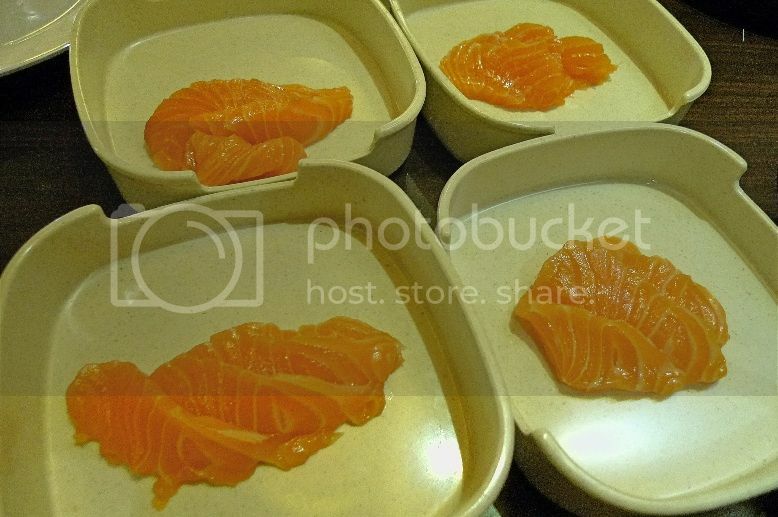 Then in true Malaysian style, everyone rushed to the counter to get their share of the salmon. Gosh! This almost reminded me of the uncivilized scrambling for chicken wings at Yuen Steamboat! As I mentioned earlier, we were at an advantage sitting so near the buffet spread. Because of this, I was able to secure 4 plates of salmon! Haha! The salmon was oh, so fresh and I immediately cooked them in the hotpot. 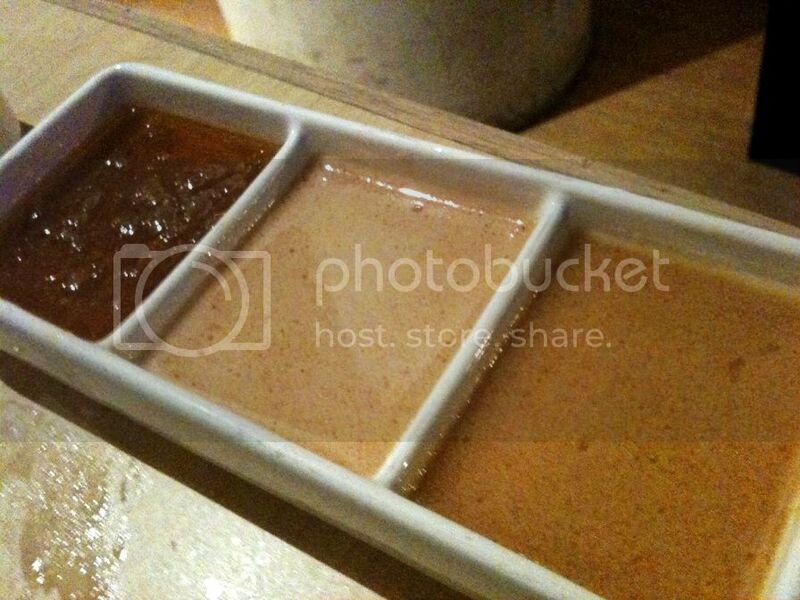 By the way, it is all individual hotpot in Nagomi which is good as it is more hygienic and customizable. 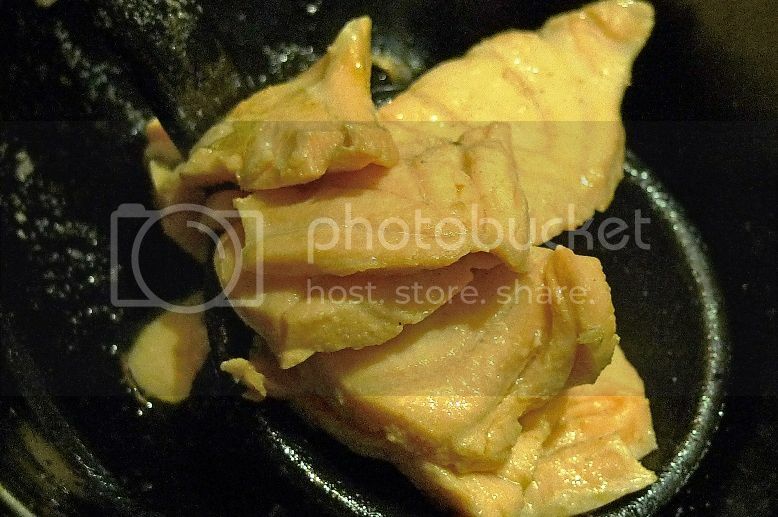 Besides, it's no fun cooking your salmon in a shared pot and finding out that someone else had eaten it! LOL! 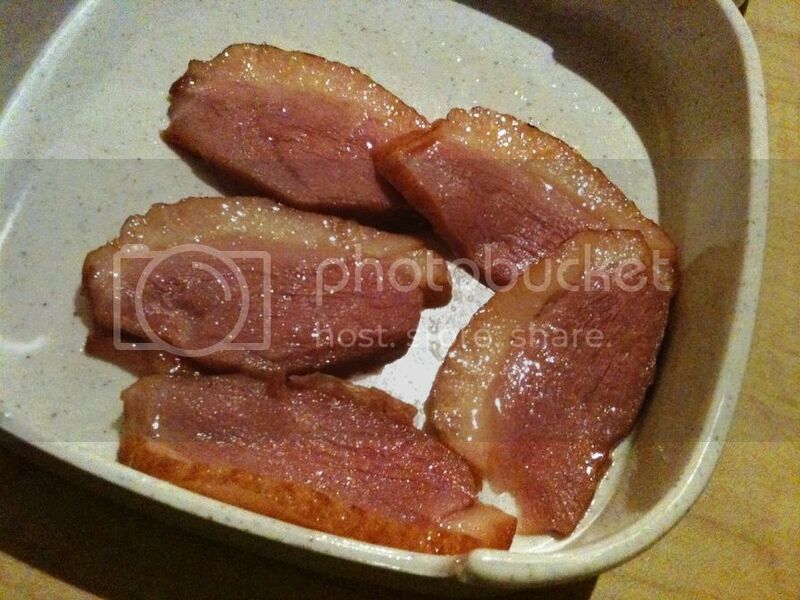 Besides seafood, Nagomi also serve thinly sliced meat. There were 4 choices to choose from - chicken, lamb, beef and duck. The first time I tried all, but on my second visit, I only went for the beef and duck. Oh, did I mention that they also have sushi, vegetables, red bean soup, fruits and desserts too? The sushi was not nice so I did not eat much. 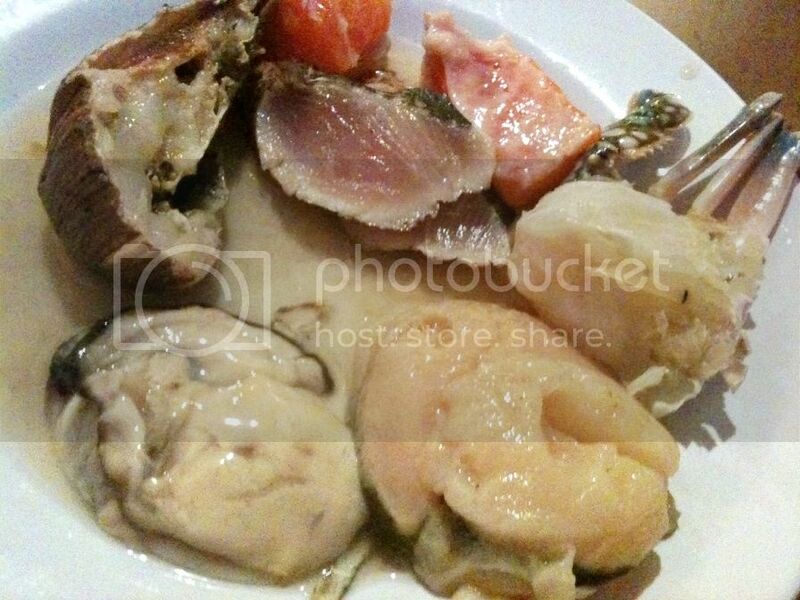 Anyway, you would not want to waste your stomach space for such things as sushi when there were abundance of seafood! Haha! Fruits and desserts were rather limited. On my first visit, I did not know they have ice creams! I only discovered it during my second visit when I saw a staff manning an ice cream machine. Unfortunately, I was told the machine was down that evening! What a bummer! Anyway, after the buffet, I and my friends went to Snowflake and I got myself a Japanese Combo II which was perfect after a hot steamboat meal! The vegetables in Nagomi were very fresh but I noticed not many people eating them. This just shows how unhealthy most people's diets are with lots of meat and very little vegetables! 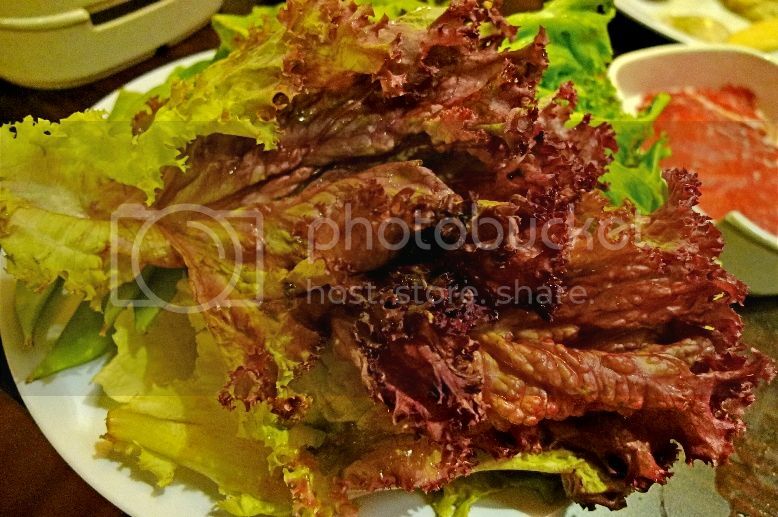 If you go to Nagomi, make sure you eat their fresh vegetables too! 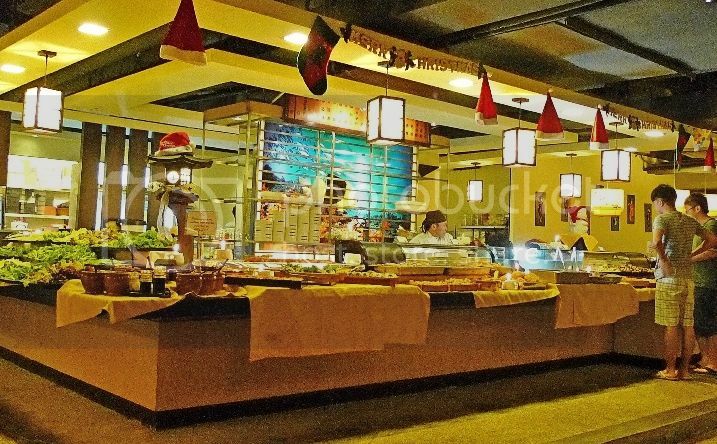 I really enjoyed my steamboat buffet at Nagomi. 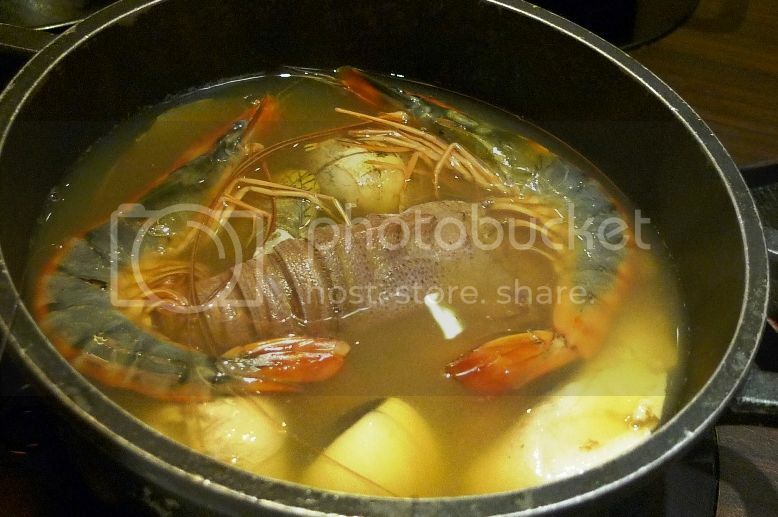 I am not sure how much longer the price at RM32.80++ will remain but I may just go there again for the third time! Hopefully, the lobsters and scallops will not be missing like the crabs.